Explore the Unique Beauty of God's Own Place adding spices to your life. Make your journey a dream come true experience. Present your loved ones with the clear splendor of what you have. This Trip of 6 nights and 7 days enjoy the best of Kerala tour package i.e. Athirapally which is within the breathtaking embrace of the deep forests, a rich and diverse flora & fauna abounds. Athirapally Waterfalls are often referred to as the Niagara Falls of India. The Western Ghats is famous for its picture book towns, sprawling tea gardens, mist clad hills, sanctuaries, Alleppey to check in to the Houseboat for a 20 hour long cruise through the world famous backwaters of Kerala, Munnar and Thekkady sightseeing and lots more. Book your kerala trip now!! Welcome to God’s Own Country. Upon arrival our representative will greet you at Kochi Airport/Railway Station. Later proceed to Athirapally. Reach and check-in at the hotel. Relax for a while amidst the comforts of your room. Athirapally which is within the breathtaking embrace of the deep forests, a rich and diverse flora & fauna abounds. Athirapally Waterfalls are often referred to as the Niagara Falls of India. Behold the spectacular view of the crashing 80 ft waterfalls. Athirapally lying with the wilderness of the Sholayar Range with a breathtaking embrace of the deep forests, a rich and diverse flora & fauna abounds. Overnight stay at the Hotel/Resort. After refreshing breakfast, proceed to Munnar, This small town in the Western Ghats is famous for its picture book towns, sprawling tea gardens, mist clad hills, sanctuaries and above all the climate is one of the most sought after tourist destination in India today. Munnar is the gateway of Hills in South India.On the way you can also watch the lovely waterfalls of Cheeyappara & Valara and later Reach & check in at the hotel and relax for a while amidst the comforts of your room. Explore the rest of the day along with the nature. Overnight stay at the Hotel/Resort. Check out of the hotel at 8.00am and proceed to Alleppey to check in to the Houseboat for a 20 hour long cruise through the world famous backwaters of Kerala. Houseboat (Kettuvalloms) is a indigenously developed and designed private boat with fully furnished spacious bath attached bed rooms, hygiene kitchen ,dining area and private front deck to capture the beauty of the back waters. 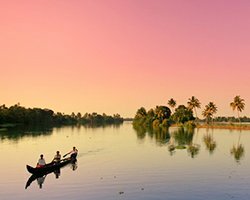 The cruise through palm fringed narrow canals, the unique life of the backwater people and above all the nature around you will make long lasting impressions in your mind. Overnight stay in a houseboat. After sumptuous breakfast, Check out of the houseboat from Alleppey at 9.00 am and proceed to Cherai beach. On the way visit Cochin Sight seeing..Visit Fort Cochin beach, Chinese Fishing nets, St.Francis Basilica, Jew Synagogue, Matanchery Street. Later proceed to Cherai. Leisure time at the Beach. Overnight stay at Cherai. Relish your breakfast, It is time to say good bye to a memorable holidays and transfer to Cochin Airport for your onward journey. End of services.